PDF is one of the most important extension for the documents we use. Nowadays, in office or in institute we use PDF documents.Whether it is Semester notes or guidelines for anything, in most of the case we share PDF files. But we face the problem when it comes to reduce the size of the PDF file. In many Job sites they mention to upload your CV or official document in PDF format. But they mention the size of the file under which you need upload. In most of the case we need to reduce the size of the file. 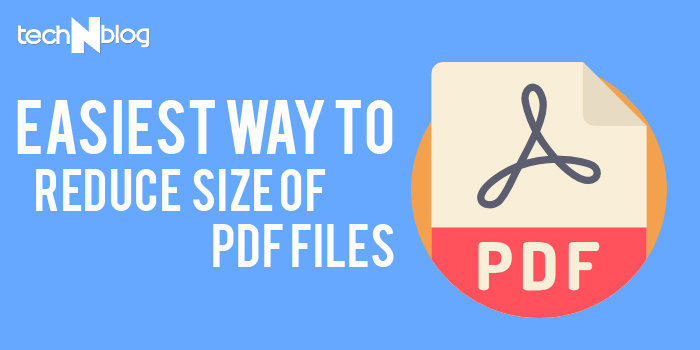 So today, I will share the 2 most easiest way to reduce PDF file size. From the name of the site “SmallPDF” , we can understand well what task this site can perform. The advantage is you can access the site from your Mobile, tablet ,Laptop or from your PC. The site “SmallPDF” is completely free website and you need not to be an expert to use this site.SO lets get into the step by step easiest way to reduce the PDF file size. You know the basic step? Yes you guessed it right. Open your browser (Chrome or Mozilla), and type “www.smallpdf.com” and press enter. Homepage will be appear. From the list of options, choose Compress PDF. In the next page, you can see the PDF Compression interface. So, there we got various option to upload our file, which we want to compress. You can see the “Drag and drop” option and below this you can also click and select the desired file. And if you have “Dropbox” or “GoogleDrive” Account, you can upload it from there too. Get Free Blogging Tutorials & Updates. Whoa! You did that. You can download the file, convert it to JPG or save the file directly to Google Drive or Dropbox. In this case, a file of 1.1MB size has been minimized to ~700 KB. In short, I can say , this the best tool I prefer to Compress the size of PDF files. PDF Squeezer is one of the simplest and most effective tools to compress PDF documents. It’s a paid software that I have been using for a while. When compared to the fully-fledged PDF suites, PDF Squeezer is more of a minimal software. You can download it from the iTunes Store, for an amount near $10. But, trust me, you are not going to waste that money. If you’re someone who deals with PDF files so often probably like me, you’ll find PDF Squeezer to be ultra-useful. The steps of reducing PDF files’ size are pretty easy too. Open PDF Squeezer and you can see the ultra-simple UI of the software. Drag and Drop the file that you need to compress. Wait for a few seconds while PDF Squeezer does its job. That’s it; you now have the compressed version of the PDF document. When compared to other methods, it takes less time and the file size is the lowest. Also, there are a few modes of customization available. For instance, you can decide the dpi level of the output PDF document. You can also create certain filters for the specific purposes. For instance, if you often convert PDF documents into grey scale, there’s an option to add the filter and convert the input file into that type. Subscribe Now and Never miss a latest update and Blogging tutorials in Bengali.